I'm back in the Land of Boudin. 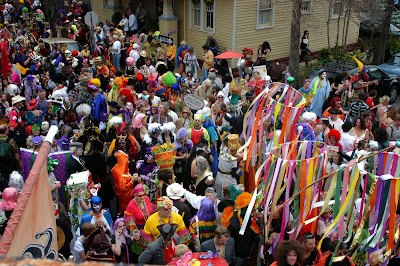 Mardi Gras in New Orleans was WOW! Every one was in costume. I bet I didn't see three people out of costume. 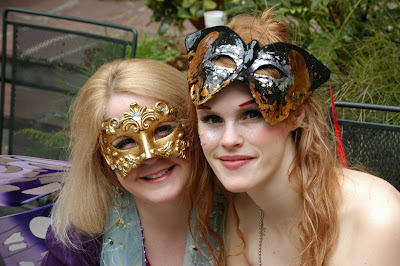 Best L. A. Norma quip of the day, "What'd you come as? Or is that just the way you look?" to a cleverly attired man wearing only shaving cream, clutching a towel and a safety razer. Norma came as a fairy. I came as an elder, overweight Lafayette. Replete with black red-lined cape. An Ausie hat with flipped up bill, banded with perfectly scaled Carnival tricolor beads, and pined on the up-flap with a jeweler's pin in the shape of a crown and set with Carnival tricolor glass jewels. 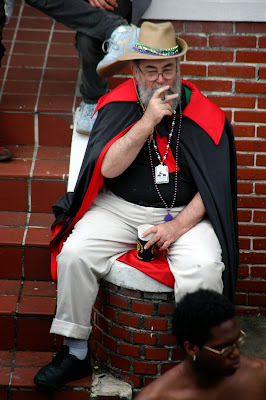 Clipping zee cape at neck waddle was a large flat African-looking red-and-black choker, and the cape's silk ties. Down an ample chest hung a French tricolor string of beads separated with tiny gold studs and ending in a flat white plaster pendant with the engraved image of a dainty little Lafayette. The piece de resistance was a black bow tie proudly tieing off my white breeches at the equator. references, and filled with old friends and blue sky. The lady who first had a telephone in our shelter came up to identify herself. She was in the elegant gold attire of a fancy angel. Which, in real life, she had been. Sunday, March 18, 3 - 6 pm . An answer to all the picture books we have about our state and city. Free New Orleans Rum cocktails! Also playing will be the dixieland jazz of Some Like It Hot.